I wanted to take along something more nutritious than meal-replacement bars or powdered protein drinks on this year’s cruise. Whatever I took needed to be able to withstand some time in transit without refrigeration. I’d been working on this version of the traditional recipe for portable soup and thought it would be a good way to see how it held up. 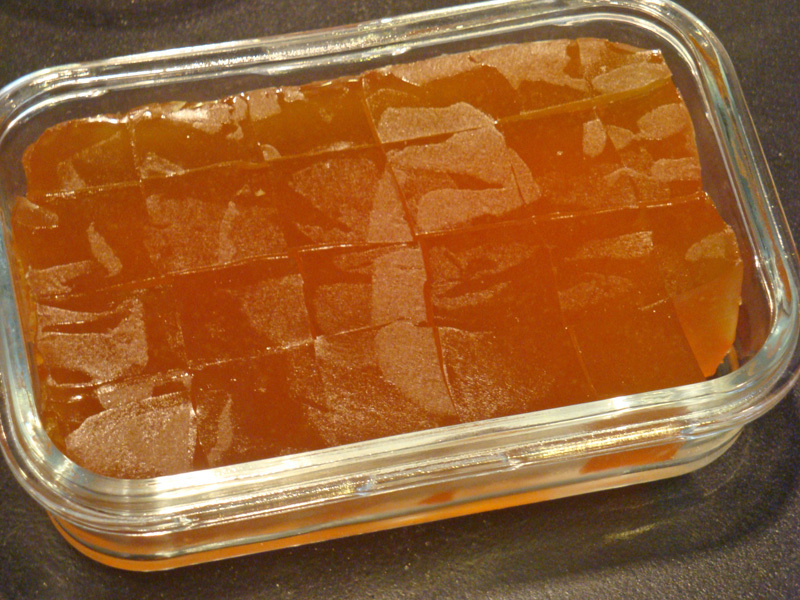 I froze some cubes of bone broth and packed them in an airtight container with a small ice pack. They were still cold when I put them in the refrigerator in my cabin, but I had no way to keep the ones I didn’t use cold on the trip home. I couldn’t freeze them beforehand and they had to go in my checked bag on the plane. They started out in the luggage compartment of the bus to the airport on a hot day in Texas. I had a late flight home, so they were unrefrigerated for 17 hours. They didn’t melt and I had a nice cup of hot, tasty, nourishing broth as a late supper when I got home! I will continue to keep my broth cold or frozen at home, but it’s good to know that it can travel if necessary. Broth made from bones is the ultimate tonic and especially good for the brain. Dr. Ann Childers, who calls herself the Nutripsych, prescribes two cups of home-made bone broth a day for the patients in her psychiatric practice. I call this Lazy Bones Broth because, although it takes a long time, it is very easy to make in the oven or in a slow cooker. Rinse bones and chicken parts under running water and put in a large stock pot. Add vinegar, peppercorns, and bay leaves and cover with cold water. Let stand for about an hour to help draw the minerals from the bones. Set pot on burner and heat until hot but do not let it come to a boil. With a spoon, skim off any scum that forms on the surface. Cover pot with a lid, leaving it slightly ajar so the broth doesn’t overheat and boil. Place in a slow oven set at slightly below boiling temperature. (Water boils at 212°F or 100° C.) Check and lower the oven temperature if your broth starts to boil. Let cook for 12 to 24 hours. (Longer is better.) Add water if necessary to keep solids covered. Alternately, cook in a slow cooker set on low. Either method will help keep the broth clear without frequent skimming and once you have determined the proper temperature, it will need little attention. When the time is up, fill a sink with cold water and place a folded kitchen towel in the bottom. Place stock pot on towel to cool quickly. When cool, dip out large pieces and then strain out remaining solids through a colander or sieve lined with 2 layers of cheesecloth or a cotton towel. Discard solids. If your broth is still cloudy, stir 2 egg whites for each 4 quarts of broth into ¼ cup cold water. Add two egg shells and stir the mixture into the hot broth. Bring to a boil, remove from heat, and let stand for 5 minutes. Strain broth again through a cloth-lined colander set over a large bowl to remove the cooked egg white and the particles it has trapped. Refrigerate broth for 6 to 8 hours. The fat will rise to the top. Do not stir until after the fat is removed or your broth will be cloudy and fatty and it won’t keep well. Spoon fat off and reserve it to use as cooking fat if desired. You should have about a gallon of broth. Add 1 to 2 teaspoons of salt or to taste. Stir gelatin, if using, into broth and reheat until dissolved. You can store the broth in the refrigerator and use within a few days for soups, stews, and sauces, or to drink as a vitamin- and mineral- rich tonic. After 3 or 4 days, the broth can be boiled again to extend its usable life. It can also be frozen, but I highly recommend that you take it a step further and reduce the broth to Bouillon Cubes. The cubes are very convenient, they take up almost no space, and they will keep much longer than liquid broth. Transfer the de-fatted bone broth to a large pot and bring to a boil over high heat. Reduce heat and simmer until liquid is reduced to 1 cup. This may take 45 minutes to several hours depending on the size and shape of your pot; a wide, shallow one will reduce faster than a narrow, deep one. Pour reduced broth into a small container, 4- by 4-inches is ideal, and refrigerate until firm. Cut into cubes. For longer storage, set cubes on a folded cotton cloth and refrigerate, uncovered, for another 8 to 24 hours to further dry out. 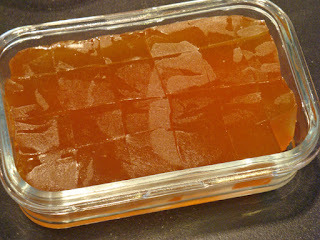 If you start with a gallon of broth, each of 16 cubes will make one cup of stock when added to one cup of hot water. Jenny, of The Nourished Kitchen, says traditionally made bouillon cubes can be stored at room temperature in an airtight container for at least six months. (I keep mine in the fridge when possible, just to be safe.) They can also be frozen in small ice cube trays for even longer storage. *You can also make bone broth with carcasses left over from roast chickens, including leg and wing bones and giblets (except liver). Freeze them until you have enough. 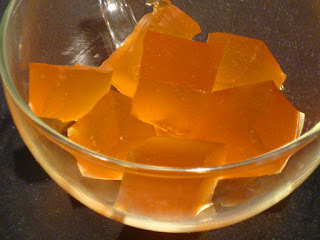 If you can find veal knuckle bones or chicken feet, add them; they are prized for their gelatin content. **You can purchase premium bovine gelatin online. 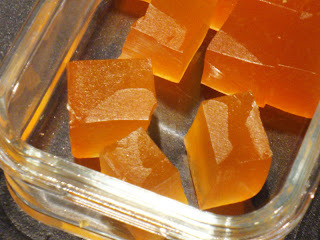 I like Great Lakes Kosher gelatin. 1. Some dictionaries say it is stock if it is made with just bones and broth if it is made with meat and bones, but the terms are used interchangeably. 3. If you want to speed up the cooking time, hack the bones into pieces about 2-inches long with a cleaver to expose the marrow. Broth, DIY Bouillon Cubes, Traveling Soup. Bookmark. Judy, where does one find bovine gelatin? Special order? The brand I mentioned is sold on Amazon and other sites. Just search for Great Lakes gelatin and you'll find it. It isn't cheap, but it lasts a long, long time. You can always use Knox if you like, but I think it is worth paying more for a quality product. I think you'll find the portable soup useful on your trips. You can't always eat well when you are travelling, but this can be "insurance" that you'll always have something nourishing on hand. A cube in your morning coffee tastes great and starts the day off right. Does this work with beef bones? Any particular bones/parts more desirable than others? HunBun: Actually I think it would be even better with beef or pork bones. The big bones with marrow are preferred, but more expensive. I just made two batches of broth, one with rib and marrow bones from grass-fed beef that I bought from a Bill the Butcher shop. The marrow bones were pretty expensive. Bones from pastured pork, however, were very cheap and they also made excellent broth. You can save up your bones from steaks and chops and freeze them until you have enough, then they are free! Well, I tried the beef..and am decidedly underwhelmed. I went to the grocery store and wanted to get some marrow bones cut down (7-8" long and up to 2"diameter)…meat department lady said they were more pet bones than anything and for what I was doing I should use neck bones. 6 pounds of neck bones…followed the instructions…21 hours in the oven…fairly anemic tasting, even after salting. Piffle. Should I have insisted on the "pet" bones? HumBun: Mine was a bit wimpy when I used beef bones, compared to pork or poultry. I think you have to brown the bones to get the rich flavor we expect–that makes it less healthful though. Interestingly, I didn't put any gelatin in it but you sure couldn't tell! Very spoonable stuff! I put it in qt. containers and in the freezer for when I make beef-veg soup later this year. Found a vendor at the Farmer's Market here that mentioned they were butchering beef and pork this week – called later and ordered good marrow bones from each. HunBun: lucky you! Maybe I'll check out some local farmers markets. I'd like to find a source for local, grass-fed and pastured meat as well as bones. Donna, either way works. If they have been browned or roasted first, the broth will taste better, but there might be more nutrition in raw bones. I often use a combination of whatever I have on hand. I have never had a specific recipe for bone broth and also just boil them for ever on stove .. your recipe calls for keeping it just below boil point .. what bad thing does boiling do ???? Anonymous, boiling the broth makes it cloudy. If you wait until you have removed the fat, you can boil it down to concentrate it without a problem. Also, the more fat is heated, the more it is degraded so less heat is better until the fat is skimmed off.